MyLymeTest | What are the symptoms of Lyme Disease? 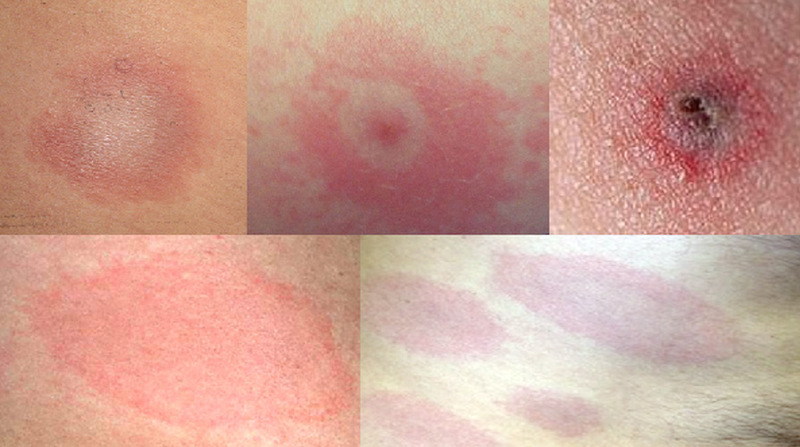 A ring-like red rash (bulls-eye rash) around the area of the tick bite is diagnostic for Lyme disease. Flu-like symptoms (fatigue, headache, fever, muscle or joint soreness) and much later, arthritis and neurologic problems are all signs of Lyme disease. How long does it typically take after the tick bite for Lyme symptoms to appear? Is it possible to test the tick to see if its infected? In most cases, it takes from 3 to 30 days after being bitten by a tick to develop the initial symptoms of Lyme disease. Because the risk of infection transmission also depends on the infection rate in ticks in the area where the bite occurred, not all tick bites place a person at risk of getting Lyme or other tick-borne diseases. Testing ticks to see if they are infected is not routinely done, but if you live in a Lyme endemic area, check with your local or state health departments to see if they do testing on submitted ticks. Lyme specialty labs do test ticks. Remember not all infected ticks will transmit Lyme disease, so testing the tick is not always beneficial. Just as everyone who is bitten does not come down with Lyme disease, not everyone who has Lyme disease recalls being bitten by a tick. This is because ticks are small and can fall off without the person realizing they have been bitten or because the tick bite occurred in an area of the body that is not readily visible. The myLymeTest meets the Centers for Disease Control (CDC) guidelines for Lyme disease diagnosis. If you feel you might be at risk, order your test today.